For this week's simple recipe, I thought we would jet off to the sunny climes of South-East Asia. Reputed for its use of fresh ingredients and wealth of incredible flavour combinations, cuisine from this part of the word is both distinctive and delicious. What's more, the use of fresh ingredients helps ensure that recipes are often rich in varied nutrients, boosting their health credentials. 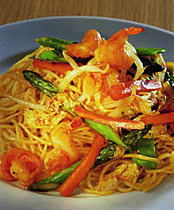 This particular recipe features crispy prawns, fragrant spices and fresh vegetables such as asparagus, which are pretty seasonal at the moment. Another bonus of this stir-fry is the speed of preparation, simply chop the vegetables, add to the wok and you are virtually ready to go, perfect for when the weather hots up and putting the oven on seems unnecessary. 1. Mix together the soy sauce, cornflour and sugar in a small bowl and reserve. 2. Heat a large wok, then add 3 tablespoons of the oil and heat until almost smoking. Add the prawns and stir-fry for 4 minutes, or until pink all over. Using a slotted spoon, transfer the prawns to a plate and keep warm in a low oven. 3. Add the remaining oil to the wok and when just smoking, add the carrots and ginger and stir-fry for 1 minute, or until slightly softened, then add the mangetout peas and stir-fry for a further 1 minute. Add the asparagus and stir-fry for 4 minutes, or until softened. 4. Add the beansprouts and Chinese leaves and stir-fry for 2 minutes, or until the leaves are slightly wilted. Pour in the soy sauce mixture and return the prawns to the wok. Stir-fry over a medium heat until piping hot, then add the sesame oil, give a final stir and serve immediately. If you can't get hold of the specific vegetables listed in the ingredients, just use whatever you like the taste of and have access to. Simply make sure they are stir-fried for long enough to soften them without taking away their crunch. For more simple recipes from around the world, check back next week for another blog instalment. Alternatively our great new recipe books featuring stunning Mediterranean, Caribbean and South-East Asian dishes are out now.